UPDATE: San Francisco Giants catcher Buster Posey suffered a broken bone in his left ankle after a collision at the plate during Wednesday night's loss to the Florida Marlins. Chris Haft of MLB.com reported that he will likely miss the rest of the season. 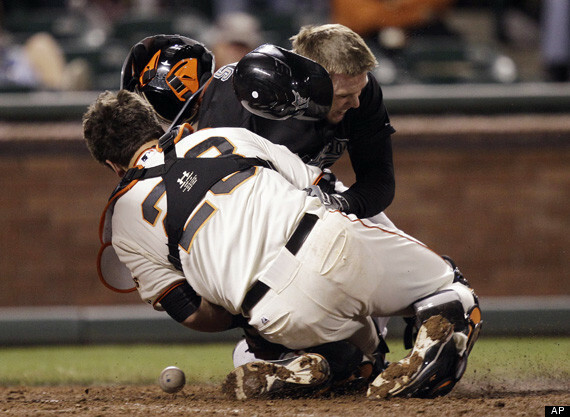 SAN FRANCISCO -- Buster Posey laid in the dirt around home plate, dazed, writhing in pain and curling up in a ball. AT&T Park fell silent, fans covering their mouths in disbelief. In the blink of an eye Wednesday night, the road back to the World Series for the defending champion San Francisco Giants took a dramatic and painful twist. 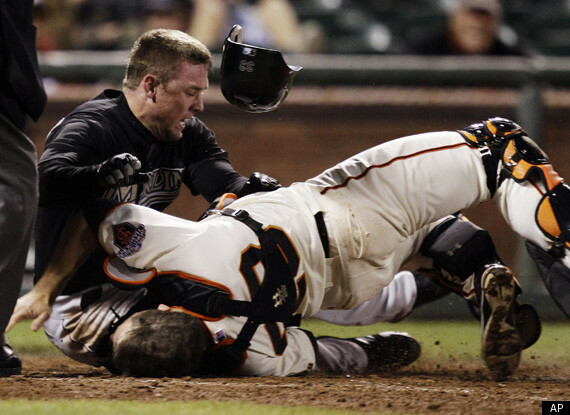 Scott Cousins scored the go-ahead run in a brutal collision with Posey at home plate in the 12th inning, injuring the Giants star catcher in a 7-6 loss to the Florida Marlins. The Giants said there would be no test results released until Thursday, when he'll have an MRI exam. Teammates were still coming to grips with the loss. "It's huge. He's one of the leaders of the team already and what he brings every day is something you can't replace," Giants right fielder Nate Schierholtz said. "I'm just hoping for the best. I couldn't really see what happened from out there. I was just hoping for the best, maybe he got the wind knocked out of him or something." All this came after the Giants rallied from four runs down in the ninth in one of the wildest nights of their young season. The deciding play came when Emilio Bonifacio hit a shallow fly ball to right-center off Guillermo Mota (2-1) for the second out. Cousins tagged from third base on the sacrifice fly, beating the throw from Schierholtz and lowering his shoulder to slam into Posey for a clean - albeit cringing - hit on the reigning NL Rookie of the Year. Cousins was safe as Posey never could quite corral the ball. Cousins, who went to the University San Francisco, lives in the Bay Area and had almost a dozen friends and family in attendance, said he felt sorry for injuring Posey but believed it was a clean baseball play. "I felt like he was blocking the dish. It's the go-ahead run to win the game, I got to do whatever I can to score," Cousins said. "I'm not trying to end anybody's season or anything like that. I just was trying to play hard and score the go-ahead run. He didn't say much and you could tell he was in pain. "And when their manager, when Bruce came out, he was pretty frustrated. I didn't want to make things any more tense." After several minutes of being attending to at the plate, with fans finally chanting "Posey! Posey!" he was helped off the field by two team trainers holding his left leg and looking stunned. "It's the toughest play in baseball. You hate to see it," Giants manager Bruce Bochy said. "As a catcher you know what it's like, and you don't like it. Believe me. When I see him laying there, it's certainly not a good feeling." All this after the Giants batted around in the ninth to score four runs and force extra innings. Ryan Webb (1-3) pitched a scoreless inning for the win. Marlins reliever Edward Mujica gave up a single to Schierholtz and a double to Miguel Tejada in the ninth. Leo Nunez entered with one out, and Schierholtz scored on a passed ball by catcher John Buck. Pinch-hitter Pat Burrell had a bloop RBI single to center, trimming Florida's lead to 6-4. Nunez struck out Andres Torres before Freddy Sanchez doubled to put the tying runs in scoring position. Aubrey Huff followed with a two-run single to make it 6-all, handing Nunez his first blown save in 19 chances. A good number of fans had left when Mike Stanton's bases-clearing double in the ninth gave the Marlins a four-run lead, and the ones who stayed received quite a show. Stanton appeared to give Florida all the cushion it would need with the two-out double to left-center off Javier Lopez to put the Marlins ahead 6-2. Those runs at least gave Florida another opportunity in extra innings after Nunez blew the save, spoiling a sharp outing by starter Chris Volstad. But the night would belong to a play that could have serious implications for San Francisco's season. Posey had already taken several foul tips off his mask and leg this season, and some observers have long argued a slugger of his caliber shouldn't be behind the plate - where hits can be a routine. Posey had even talked about trying a more conventional mask next spring training instead of the hockey-style one he uses. But the mask had nothing to do with this blow. Cousins said he felt for Posey and repeatedly mentioned that he wasn't trying to injury him. He said he would find a way to send condolences to the other clubhouse and wish Posey well. "It's a baseball play. I feel bad for Buster Posey, I really do," Cousins said. "I'm going to send a message over there to them." NOTES: Marlins RHP Josh Johnson (right shoulder inflammation) threw for about 5 minutes on flat ground from 60 feet without any discomfort. Marlins manager Edwin Rodriguez said Johnson will long toss next and was still hopeful his ace could be return by June 1. 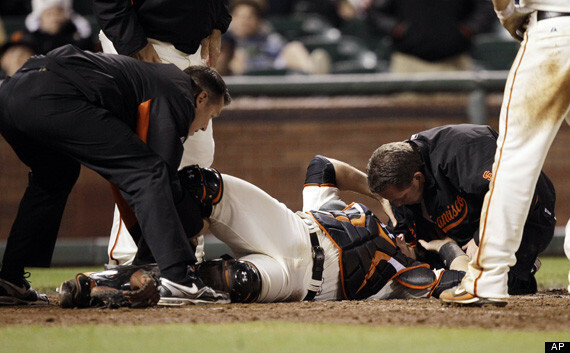 ... Giants speedster Darren Ford has a sprained left ankle and will likely be out for at least five days. ... Marlins SS Hanley Ramirez was removed in the bottom of the ninth because of a right foot contusion. He is day to day. ... Tejada turned 37 on Wednesday. 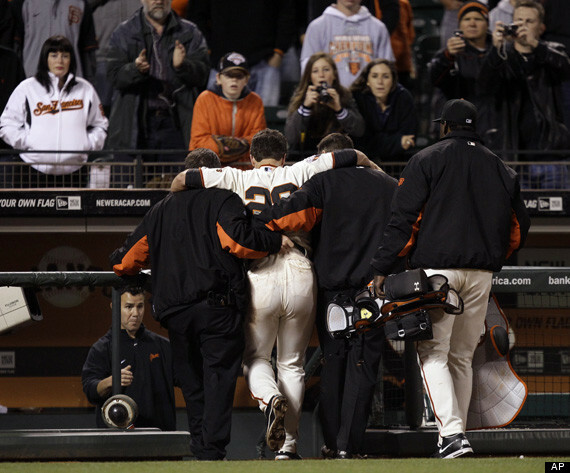 ... Giants SS Mike Fontenot left the game after he strained his left groin running to first on a groundout in the fourth. He is day to day.